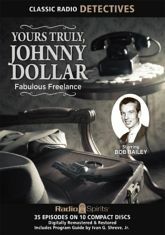 Bailey is the definitive Dollar - the character's wry sense of humor fits the actor like a tailor-made suit. He's a man of keen analytical skills and good nature, a man who can use his fists in a tight spot without being an obnoxious "tough guy." Hit the road with our hero for thirty five intriguing episodes, including five 5-part serials (two of which are missing a middle chapter).